Mercedes will spend 160 million euros to make the R class look more masculine. STUTTGART -- Mercedes-Benz is giving its R class an expensive beauty treatment exceeded only by a recent face-lift for its luxury SL sports car. With a new front end, the R class will look significantly more masculine and will be positioned much more like an SUV. The goal is to achieve greater acceptance in the United States, its core market. 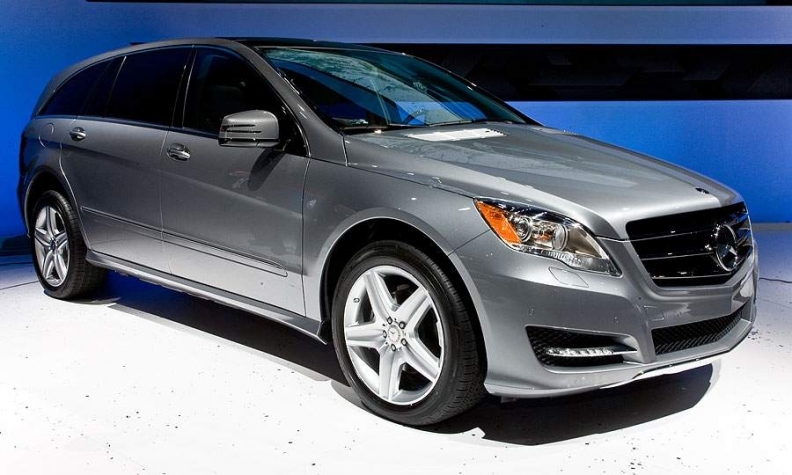 Last year, Mercedes sold 2,825 R-class units in the United States, down 64 percent from the 7,733 sold in 2008. The R class is a combination of an SUV, minivan and station wagon and is built at Mercedes' factory in Vance, Alabama, alongside the M class and GL class SUVs. Mercedes is spending 160 million euros ($217 million) to upgrade the model. The investment will likely give the R class its last chance to reach acceptable production volumes. In 2006, its second sales year, more than 37,500 units were delivered. But sales fell to a little more than 10,000 last year. In internal planning, Mercedes is aiming for sales of 30,000 units worldwide. Christoph Stuermer, an analyst at IHS Global Insight, is skeptical. "With the face-lift, sales can probably be stabilized," he said. "But to really expand its volume, Mercedes needs a fundamentally different vehicle that is based on a car platform and has significantly lower fuel consumption."